I recently finished an interview with Ellen Maurer-Zilioli for Art Jewelry Forum, take a look —-> HERE ! Thanks to Susan Cummins and Ellen for their cooperation. KR: Your gallery is located in a space that looks as though it’s still a humble food market. How does the everyday nature of the grocery store reflect the subtleties and universality of artworks in contemporary jewelry? CVH: Humble is not an aspect I saw in it first although there is a lot of humbleness involved as well ! I recognized going to this kind of shop with my mother and seeing the owner taking extra care of her, she was never the big supermarket kind. He knew what kind of apples she wanted; he knew she liked her tomatoes in this way and not another way. He knew when he could have a season specialty which one he could put aside for her. He would carry it out, keeps things aside. Everything was stacked high and all over and he could still find exactly what he needed. This is the similarity with the current activity of the place. It occurred naturally to my mind, without thinking. Do you see the gallery as an artwork in and of itself? I never did, although people start to know of it as “the grocery store” and either they understand or it makes them think and hopefully they get it. You are also located in an area with other contemporary art galleries. What is the overall reception of your space and of the work you carry in relation to those other galleries? Is it considered equal to the art world on a local level? Here as for any other jewelry gallery in the world, jewelry is starting to gain more attention in general as a collector’s item. Most people do not know there is something else than high jewelry, couture jewelry, artist jewelry or fashion jewelry. All the types can exist with each other. The most important factor in this comparison is “qualitative” jewelry. “Qualitative” jewelry will gain attention and rise in value, whether it is a nice Cartier piece, a great Chanel bracelet or a Picasso pendant. Just like many others in our field, it seems that a big part of your mission as an art-jewelry gallerist is to show jewelry from different perspectives than most people outside our sphere are used to. Would you like to speak a bit about your writing projects and what kind of language you’ve needed to develop to do so? There is not one single answer to that. It’s like when people buy art, some want a whole explanation, some others just want to look at a piece and fall in love with it. As a gallery you feel when is the right level of education necessary for which audience. What is the importance of travel to your gallery and attending international events like Design Miami for example; events not solely related to contemporary jewelry? When I started there were some established galleries around. Brussels and Amsterdam are only two hours away from each other. You have to take your ball and find new friends to play with. How often do you find yourself giving a comprehensive explanation for the type of gallery you have; Would you define your role as a gallerist somewhat similar to that of an educator? Yes, every day, all day. To everyone, schools, clients and press. Recently you have celebrated the 5th anniversary of your gallery. Can you talk a bit about the exhibition, This was 2007? It is a very personal exhibition and based upon a very limited time frame. It just illustrates how little my environment was when I opened the gallery. It shows work from people I was in touch with, or work that impressed me and work from some artists with whom we work now. It is only a recollection of some interaction. Not a selection based on quality whatsoever. What would you say has been accomplished since you’ve opened your doors? Too much to say ! I had nothing and knew nothing, no experience in galleries, no clients, no acquaintances in Brussels, nothing. What should we look for in the next five years to come? 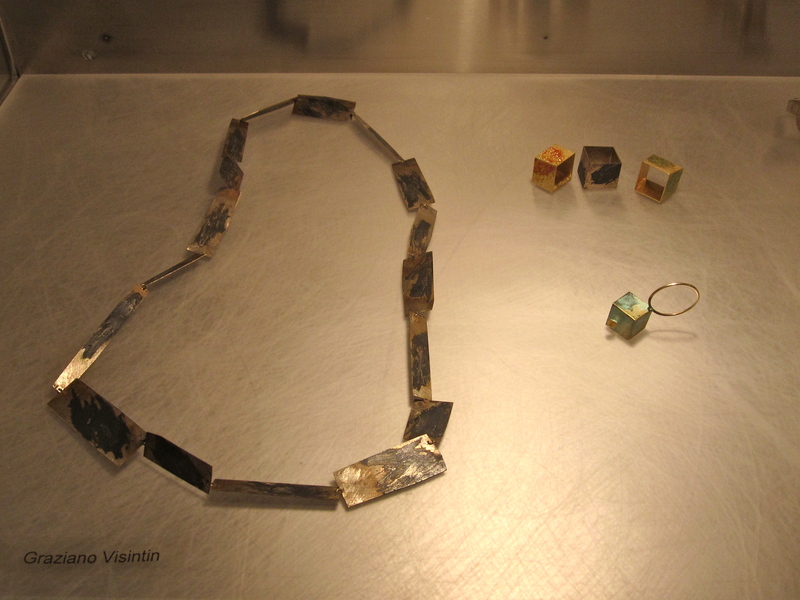 Caroline Van Hoek is a contemporary art jewelry gallery located in Brussels, Belgium. Please visit the gallery website —> here. Note: This interview was conducted in the fall of 2012 and originally destined for AJF, facilitated by Susan Cummins. Alternatively, ≥ has the pleasure of posting it and thanks Caroline for her participation. Kellie: Let’s start with a bit about the gallery. You have been here for about 15 years now? Rita: 15 years now, yes. K: This is a unique space for Rome. Since its opening, how has the gallery changed? Is there a difference in the people you meet who are coming in? K: Sure, I imagine because this kind of gallery is so unique, when people walk in thinking it’s a shop, they must be sort of confused. Is your gallery now more of a destination? R: Yes, definitely yes. We have a clientele of people who know they can find certain things here. K: This is quite a gem, it really is. K: I was surprised to find a relatively large contemporary art scene here in Rome that I don’t think many people come to the city for. How would you say the gallery is connected to the larger contemporary art sphere here, or what is your relationship to other mainstream contemporary art galleries in the city? R: Oh, none whatsoever… in the sense that this field here is quite, not only in Italy but worldwide, is quite apart from what art galleries do in general. They’re sort of parallel; they don’t seem to ever meet, if you see what I mean. K: Are you interested in trying to converge, or getting those people in here to see the work in a similar way? R: Yes, yes it would be interesting. It would be interesting to how the public would respond to—and in a way we have done that by taking part in Collect in London, which is at the Saatchi Gallery—it’s more for a public who is looking to collect this sort of jewelry, people with more of an open mind. It’s very difficult I would say, Andrea do you have anything to add to that? R: Art, let’s say, the world we are in, art jewelry, and, you know, real art as it were—they don’t seem to mix much. A: Not very much. Not very much because the public, the customer, or the collector, is quite separate. It is quite difficult to mix—the people usually buy glass or ceramics in this way. K: Do you think it is a reflection of people being unaware that this sort of art form exists? R: Well, I think it’s both that, obviously. To a large extent, it’s the fact that they are unaware of it. But it’s not just that. I think it’s also the fact that the art world has its circuit of critics and there’s a market there, whereas this sort of art, let’s say, if we can call it that, doesn’t have a market for these sort of things. You could even be one of the best like Babetto or Skubic or any of those, but your pieces will have a market when you’re buying—I mean they have their price on them when you’re buying them, but if you were to resell them, unless you’re selling them to someone in this sort of field who knows about what the value is, then you’re not going to be able to remarket them at the same price. A: It’s not an investment for them. K: So it’s almost like a separate but quasi-equal sort of thing. R: Yes, exactly. It’s like a railroad track. A: They’re parallel. In fact in the business sense, it’s very difficult for them to cross. In the other sense, the artist sense, it’s completely different kind of crossover. There’s a big difference [between the two]; the business sense is parallel, but there are two different markets. R: But also I’ve seen a lot of resistance, if I can call it that, on behalf of art galleries, as it were, to let this sort of art into their galleries. K: It’s incredibly apparent. I’m interested in finding people and galleries that will take this kind of work, or at least for them to start thinking about a crossover, and I think what has to happen first is people creating new spaces for that. A lot of my thinking is about how to do it. What you are saying about the different markets and investment aspect of it all is interesting when you think of it this way. R: Yeah. I think that counts a lot. A: Jewelry is also a used— they become used pieces. R: You actually wear them and use them. A: Yeah, it’s a consumer piece. You buy, you wear, you destroy… and there is not quite a long term that you really can use it necessarily. R: It depends on the material also. A: It is an art of time, it’s a short art. A: Exactly. A sculpture, you put it in the corner and it can stay there for a thousand years. But jewelry as a piece of art, you wear, you destroy. R: Right, it won’t last. A: This is another unique aspect of the jewelry art, the art jewelry. K: This may be a loaded question. 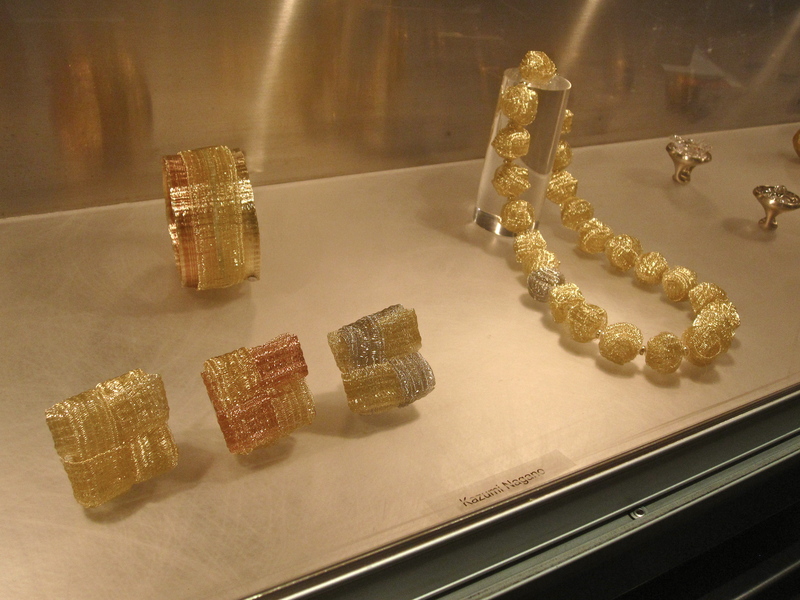 How do you, as a gallerist, see jewelry as an expressive form of art? I have this theory, greater than or equal to, and sometimes I see the potential of jewelry to be greater than because of some of the things we’ve been talking about—how you live with it and use it— and I would say, as a concept, that is far greater than just hanging something on the wall and having it there forever. R: Well I wouldn’t say it’s greater than or less than; it’s one of the many forms of art to me anyway, so I value it equally. To me, it might be more valuable because I might get more enjoyment out of actually wearing a piece of jewelry, but not necessarily I think. I would like to consider it as I would a beautiful sculpture that I look at in my house, that I enjoy looking at. I might get less enjoyment, because I’m not actually physically touching it and wearing it, but I would put them on the same level, whereas I think a lot of people wouldn’t. K. Absolutely. Do you think that in Italy, versus other countries in Europe and America certainly, there is a bigger community of people who understand that? How do you gauge the awareness of jewelry’s artistic value? R: Compared to other countries? R: Well I think compared to for example, Holland and Germany, there’s less awareness here. 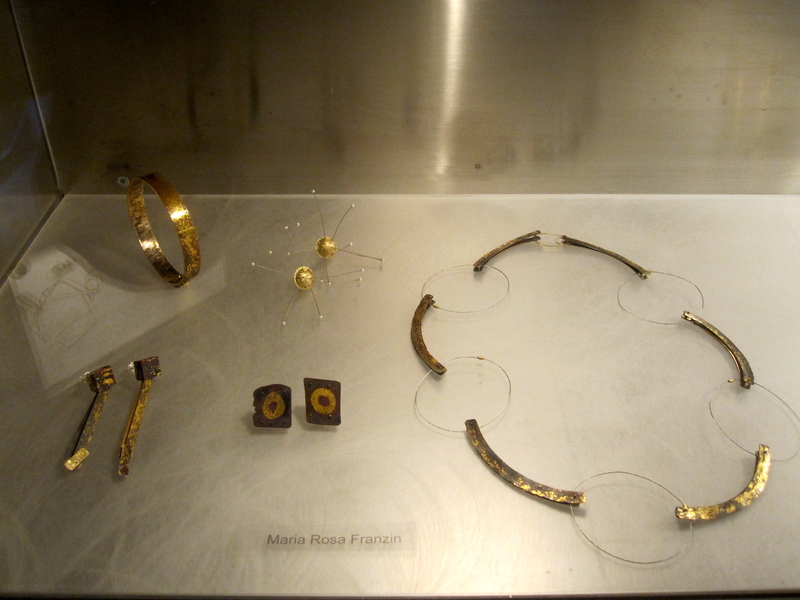 Because I think an important factor is that there aren’t any museums here in this country dedicated to this sort of jewelry, whereas in other countries like the States and Northern Europe, you get museums that are totally, or not totally but partially at least, dedicated to this sort of art. Whereas in Italy, there’s just a small section in Palazzo Pitti in Florence…and that’s about it. And so you don’t get much public awareness, because I think it’s important for the public to actually see this sort of jewelry in a museum to be able to associate the idea that it is a work of art. And if you don’t, then you just see it in a gallery, you know, as if it were a piece of clothing or any other object you see around in shops, and it’s not quite enough, especially because there aren’t that many galleries in Italy anyway. We are one of the very few. It’s very hard. And as a gallery, you don’t get any funding or help from the state anyway, so it’s all up to private individuals. K: It seems almost strange because of the historical and cultural significance of jewelry in Italy’s past, like the Padova School [at the Instituto Pietro Selvatico, Padua] and the artists coming out of Italy. Maybe Italy doesn’t see it but there are artists in Italy that do see it. It’s interesting how culturally undervalued it is; it continues to exist under the radar. I know that in Padova, there are cultural events that do showcase these goldsmiths and artists, but it is of course, very regionalized. R: Have you seen the exhibition on at the moment in Padova? R: All right, I’ll give you an initiation afterwards. Remind me, it’s a very nice exhibition, in a nice place where they usually hold their exhibitions. K: It’s so strange, that sort of divide though, because it is so prevalent to a degree there, and we all know it exists of course. What is it going to take for the work from Padova to receive some more historical recognition, in Italy and internationally? K: Yes, and Italian contemporary jewelry in general. R: Well unfortunately, the situation in Italy at the moment has changed for the worst. Because from last year was it, that the schooling laws have been changed? R: Yes, they have a lot less training hours now, so that’s going to change some things. Historically, what has come from the school of Padova has been internationally recognized. You’ve probably seen the book on the school of Padova [The Padua School, Contemporary Jewelry, Graziella Folchini Grassetto], there are a couple of important publications. So it has internationally been recognized as the most important school in Italy for that sort of jewelry, and historically also. But I think the future will be quite bleak from that point of view. K: Why do you think there is a lack of historical publications that document the evolution of the medium’s creative reality? If there’s no money going into this type of schooling in Italy anymore, then I suppose there certainly wouldn’t be any money for research either. R: Yes, that’s right. You mean in Italy? K: In Italy, or even as a reflection from other places internationally on what was happening in Italy. As I try and do research on the history of contemporary jewelry, there really is nothing. R: There’s not much, no. K: Like this book, it’s all sort of self-published writings, and very few articles. There’s no art history literature about what’s happened in the field over the last 40- 50 years, there’s just nothing. A: There’s absolutely nothing because we don’t have contemporary jewelry culture. R: Also, another problem is we don’t have a craft council here in Italy, whereas other countries do. And something like a craft council or an organization like that would in a way, invest in research on this sort of thing and also encourage publications to take notice. There’s nothing whatsoever unfortunately, and everything is as you said— this book has been published by one of the galleries in Padova, and I guess she got no funding for it. A: In fact this is a big problem, because people recognize the beauty of this kind of jewelry, but they don’t understand the value. This is absolutely different from the other kinds of jewelry [conventional], but because there isn’t a culture around the value of the craft, they don’t understand the aspect of time as value. Work made of paper, for example; how long it takes to create a brooch out of paper or with other kinds of material. And this is the biggest difficulty we have. If we put in the window, a piece made from plastic, what appears to be the difference between it as custom jewelry or ordinary jewelry? K: For us when we look at anything, all we see is time. It’s hard to understand that people don’t see it. R: Right. It’s not so much that they don’t see it, but they’re not prepared to pay that much for it. Probably because things have changed worldwide, I mean you know, clothing for very little because it’s made in China, and you can have the same sort of thing that once was— I mean if you think about it in a way, what we’re doing is a little, it’s going against, not against, but…I can’t find the words today. It’s contra corrente, come se dice in Inglese? It’s going a little away from what the rest of the world is doing. Everything is becoming manufactured, and we’re going the other way. K: Well that’s the best part about it. R: But it’s difficult in the world we live in today, to actually let people understand this. A: The world has changed completely in the past 10 years… I mean people don’t want to pay for the idea, people only want to pay for the object. People think now to to pay less for everything. You can go around and buy anything you want for a very little bit of money, or in installments… so now why would someone also pay for an idea? R: I mean we get this all the time. Somebody came in yesterday looking for a pair of earrings. She found just what she wanted and said, “Oh, they’re beautiful! How much are they… oh, but that’s too much! I mean there’s no gold, there’s no… why am I paying all this?” And it’s like trying to make people understand all the time, and it’s just so difficult! K: I can’t even imagine! A: Do you know Ikea? Their advertisement says, design furniture, without the price of design. So you have people thinking like this. R: And that’s what people would like to have probably, from this sort of jewelry. Jewelry with this sort of appeal and design, but an Ikea sort of price. K: I am sure it must be so frustrating. R: It is, it is. K: I would just love to witness a whole day of this, I would love it. So do you think that maybe if there were future crossover with this kind of work in a museum for example, people would start to understand that there’s more value than material? R: I definitely think that helps, because when we get people in from Holland for example, they are a lot more willing to pay more money and they’re not even questioning the materials or you know, you can tell they have a completely different attitude from people here. It’s been a very big struggle for us since the beginning. It’s obviously better than it was, but we’re having to explain all the time and having to—whereas when we go to London for Collect, it’s a lot different there as well. You just get another sort of response from the public, and I think it’s due to the fact that they see a lot more of it around and so it’s accepted. K: Are there people that may not know anything when first coming into the gallery that, let’s say, open their eyes after you explain a little about the work? Is there education going on? R: Oh yes, yes. That happens a lot. We try our best to educate people. K: We’ve been talking a little bit about the “Italian awareness.” You were involved in starting the ACG (Associazione Gioiello Contemporaneo), correct? K: There are a few more too—the Fondazione Cominelli in Cisano di San Felice, a more widely spread cultural and artistic foundation. There is also Preziosa in Florence, presented annually by Le Arti Orafe, and a relatively new collective also in Florence, the 1×1 Collective, formed my a handful of young artists aimed in promoting contemporary work. On the AGC’s website it’s written that it was created “due to problems specific to the world of contemporary jewelry.” What are the problems? R: Well the main problems in Italy were that the actual jewelers working in this field were very isolated; people from the north weren’t connecting to people from the south, and so I think the whole idea of the association, obviously apart from one day being able to reach a more general public and wider public which is what is happening with Cominelli actually, but I think the main idea [with the AGC] initially was to get these people together so that being together, means being able to do more. Forming a platform, forming a community I think is important. Because if you’re on your own, you’re not going to get anywhere, do anything, so that has helped a lot. I think it’s helped a lot of people in actually developing their actual work. And connecting to other people means being able to do exhibitions together and things like that. Yeah, that’s helped. Also the association is now forming a permanent collection. K: Really! That is so exciting. R: Yes, and it’s on show on the moment actually, in Salò [in Brescia at the Palazzo Municipale]. Did you go and see the Cominelli Awards? K: No, unfortunately. When was it? K: Yes, I arrived in Italy that week so it would have been impossible. R: So yes, that’s now started, and there are already 38 pieces in the collection but it’s going to grow year by year. K: Where will it be kept? R: At the moment it’s near Salò, in this Fondazione Cominelli, in Lake Garda. That’s the actual place it’s kept at the moment, and then we’ll see in the future. K: That is very exciting. You spoke about Italy’s own problems concerning contemporary jewelry, and I have a more general theory as to the bigger issue of overall acceptance of the field. I really think much of it has to do with language and semantics. I always talk about jewelry in the way that the word jewelry itself, is it’s own problem. K: People tend think of it as so many other things before they think of it is art or artistic. And so even talking about it with someone like you, someone that knows about it, just how we choose or what do we choose to call ourselves is complicated and convoluted. What am I, am I an artist jeweler? Am I a studio jeweler, a contemporary jeweler? Do I make art jewelry? Am I making wearable sculpture? It’s a really confusing classification, marginalized in the sense that it is also “craft-based.” But even if we claim or accept that we are partially craftspeople, the good work is far too unique and deep-rooted to be limited as such. None of these titles seem to communicate what exactly we are doing. R: It can’t be seen just as craft. I personally hate these terms and it’s just so—if you choose one, you’re sort of stuck in that. Design jewelry, art jewelry, why give it a label? But I think it’s probably necessary because these words exist. A: Or maybe not. Maybe it’s not necessary to classify. R: It’s the same in Italian, it’s exactly the same in Italian. In England, they call themselves designer-makers. A: Because now, for artists in the fine art world now, they don’t too much actually make their very own art pieces anymore. Like they’re designers and somebody else makes the work for them. R: So it’s more of an idea, really, and actually made by a craftsman. A: In the Renaissance, the difference between the arts and craft didn’t exist. It was exactly the same. R: Yes, after the Renaissance it separated. A: The artists continued to make their work in the Renaissance. But now, artists just think about the work, and they don’t make it. K: I’ve been having conversations with my advisor here– she is an art critic, curator, historian…among other things, about the potential of jewelry artists penetrating the contemporary art world, or making work that in one way or another fulfills those requirements. In so many words, she expressed a widespread view that unfortunately, in their world, makers cannot be thinkers. She suggested teaming up with a contemporary visual artist and making their work for them, because like you both said, that is what is happening now, artists outsourcing their work. By this logic, artists can make jewelry—or artists can have jewelry made and have it be art, but for we who make jewelry, it doesn’t get to be art because we are the makers. To them, the paths we chose are about making, not about thinking, but I don’t think is necessarily so agreed with anymore… well at least I hope. R: No, I don’t think so either. It is discouraging. K: Some days I think that I would really love this conceptual jewelry or research-based jewelry to be considered as contemporary art, without having to ask questions about what it’s called or what we should call it. But other days I just want to just love jewelry for what it is and appreciate it for being its own entity, so as far as that goes, I’m trying to understand what matters. Would you like your gallery to be more widely considered to be a place for contemporary art? Or do you value that it is jewelry in any sense of the word? R: It’s a difficult question. It’s a difficult question in the sense that obviously, I’d love this sort of jewelry to have a wider public in a way. In that sense, I would like it to become something on a wiser scale. But other than that, it’s fine by me. In fact, I’m quite disturbed about this art world rating us as a B-class. It’s quite disturbing, and I don’t find any less pleasure in looking at these things than I would in looking at something they consider art. In a way I’m quite proud of what I do. I think that’s basically all that worries me, trying to get more people to actually understand this type of jewelry. But other than that, I’m really quite pleased with the fact that it even, you know– of what it is, of what it represents in its own rite. I’m quite happy with that. It’s just being able to get more people to appreciate it and understand it without it having to be such an effort. K: Exactly. I have his sort of spiel now. When people realize that I make jewelry they usually ask me, “Oh, so do you want to work for Tiffany’s?” or something, and then I have a 20-minute explanation of how jewelry can be this and can be that… and after I go through it all, a lot of people had never heard of it before and think what we are doing is just so amazing and new. A good friend of mine is a recent graduate at Brown in contemporary art history and she really wants to be professor. I’ve given her the spiel, and fascinated, she began trying to look into it herself from a historical perpective. Of course she can’t find anything like we talked about earlier, but her fabulous idea is now to work some of this jewelry history into future curriculum, so people can actually learn about it. If you’re in an art history class, chances are you won’t argue with your professor that this stuff isn’t “real art…” it’s very idealisitic but an avenue we can begin to think about. R: Andrea went to the same sort of school as the School of Padova here in Rome, and he knew nothing of that. A: Even the university in Padova, for example, the art university, they don’t know anything about the Padova School. A: It’s in the same very small place, but they don’t know anything. They think, “contemporary jewelry? What’s this?” They live here! And they don’t even know they have the biggest contemporary jewelry school around. K: For my grant I had to write a very specific project outline and I titled it, Past and Present: Italian Contemporary Jewelry as Art; I had this idea that everyone here knew about this world, so this is a bit of a surprise! I guess they don’t. I feel lucky to know about it. 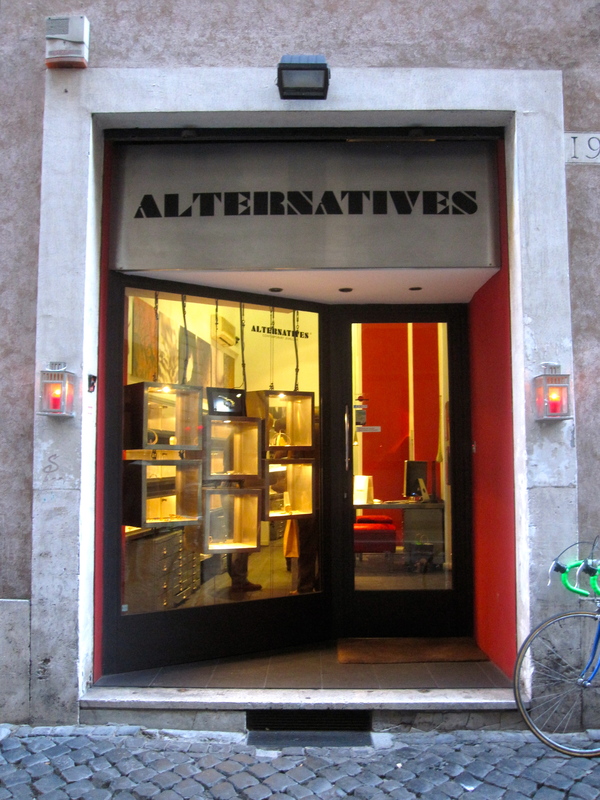 Even at RISD, where the Jewelry + Metalsmithing program is adopted from a European art academy, I had to come to Italy and meet an American art critic outside the program to learn about it. And so even going to a specialized school that values conceptual development and research-oriented work, if they don’t tell you, who will? I’m starting to realize that perhaps there are not as many people interested in this, really. R: Not many people interested… I don’t know. I guess you’re right in a way, but why? The question is why. Is it just a money-based factor, or is it… I don’t know. R: The fact that there isn’t a lot of people interested in this type of jewelry, this world, that there isn’t much interest about all this. Is it an economic factor or… I don’t know. A: Because it is very difficult; you take a sculpture, you put it in the corner, it’s responsible for itself. If you buy jewelry and wear it, you are responsible. But it’s very different from dress or clothing, or anything else you put on. Because with jewelry, you bring a very strong message. Some people dress horribly! But the jewelry is absolutely stronger than the dress. R: What he’s trying to say is that jewelry makes a statement, in a way. This sort of jewelry would make a statement on who you are or on what sort of person you are. K: When we start talking about the fundamentals of what a jewelry object is, it’s surprising to me that it is not valued conceptually. You start to think about the sociologic aspects. For example, you’re wearing a brooch. Who gave it to you? When do you wear it? Where do you put it at night? How do you live with it? I see it on you and now we’re talking about it and having a personal interaction, and to me, that is incredible. My mother is a flight attendant. I saw her a couple weeks ago and she had found a ring in the bathroom and gave it to me. It was just some cheap, fake diamond sort of thing, and I put it on and all I kept thinking about was who did it belong to before? What life did it live? 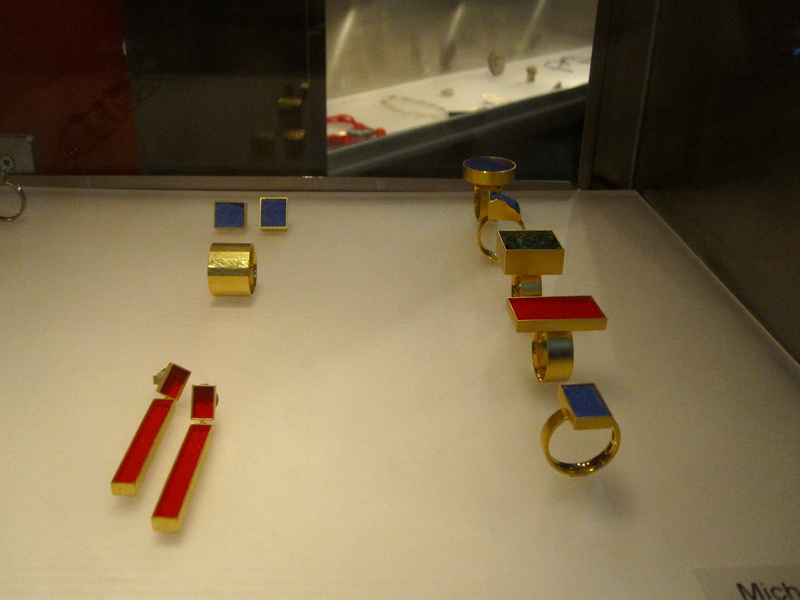 I also always think about jewelry as a social signifier and that as its own concept. How do you know a king is a king? And then of course, there are those trying to transcend the value of material—all of these qualities are so rich and fundamentally conceptual, to me anyway. We always have to deal with socioeconomics of jewelry, we always have to deal with the monetary value, and they’re relative limits that we get to work within, just like any other artistic mediums with limits to work within. And so I’m trying to find artists working this way that address these things, not so much making jewelry about jewelry, but those trying to make a larger comment on its role in the world. To me that is such an amazing concept. It’s so obvious, but people just don’t think about it. R: The industries just don’t invest in research at all. K: What else. We can talk about who you’ve had in the gallery this year, or who either of you value as am innovative maker/thinker in the field, I’d be curious to know. R: Well, for sure I think Ted Noten is definitely to be considered. I mean he, I think, is a typical example of somebody who could easily be in the art world. R: More, maybe so, because at times I think some of his pieces are probably even not wearable. K: He’s an excellent example, someone who figured out a secret formula. R: Yes. Who else can we mention? There are so many people. R: Ruudt Peters, yes, he’s another one. He’s very, very active. He changes his collections every year or two and he’s always coming up with new ideas. A: —they are freer, probably because they lost the idea of having to wear the jewelry. R: They’re not so preoccupied with what wearing jewelry means, so it becomes something else. But not necessarily at times, it’s still on the border of jewelry and sculpture, I would say. A: It’s an everyday fight with the wearable concept. This is a wonder of contemporary jewelry. R: And obviously there are more well known artists who are making jewelry all the time and have had a lot of success, more or less doing what they’ve always done from the very beginning. A: But this is our business, because if you don’t push the concept over the fence, why would you create new jewelry or continue to make traditional jewelry? R: Going back to Padova, why do you think they stayed with gold, do you have any ideas about that? K: That’s one of the questions I’m trying to answer. R: Right, I was wondering whether you had any answers from anyone explaining that. K: All I can say really, is that it is just so very much Italian. I’ve been looking for clues within Italian art history about how Italy has been able to summarize itself. For example, what did Italy take from its rediscovered past, let’s say, during neoclassicism? Then I think of rational architecture and the attempt to create a national aesthetic identity from the past; architects were looking at the way imagined geometric buildings and structures were rendered in 14th century paintings, as well as simple Italian rural architecture… and then you skip to the 1950’s and 60’s, when these goldsmiths out of Padova started making innovative work, and I really can’t say yet how much of it was a response to modernism or how much of it was uniquely Italian, surely the maintenance of gold as a material parallels Italy’s value of the past. A: Of the Padova School. Gold has also been the traditional, let’s say, material in Italy, and I think the idea was that of continuing with that material. A: We’ve grown up with the gold, and we’re continuing in the field. R: It’s what they knew how to do. K: The Italian trend is maintaining a cultural tie. A: A part is because it’s part of a tradition, but on the other hand, the use of gold is an intention of the artist. The gold gives the work more power, so if you take a very simple shape for example, a simple square ring [points to a ring by Giampaolo Babetto], if you know it’s in gold, it’s a little bit different. There is more respect, and that, for example, the very simple shape and the very minimalist form could make them very important objects in gold. K: This reminds me of engravers during the neoclassic era. For something to have been engraved in that manner, it was a very finite and precise decision of what to render, extremely selective and tedious. This has the same sense to it; if one decides to “just” make a cube, a perfect cube and it is made in gold, one can’t quite argue with that. It really highlights the decision and the choice of the artist. A: The decision to use different material is absolutely important…for the color, but it’s not only the color— it was a way to convince people that it was a real piece of art. People used to think of jewelry as only in gold. If it’s not in gold it’s not jewelry. R: A lot of people still think that. R: I mean for 1979, these rings were probably something very, very innovative. I mean, you just think of it as a normal ring now, but you have to think of when it was made [referencing Babetto]. K: I can imagine. I have become quite obsessed with him, I have. I can honestly credit this man for my being here entirely.